Mike Reeder is a 63-year-old Vietnam War veteran who lost his legs in an explosion during combat. He returned to the U.S. looking for purpose and direction and found them during a chance encounter in a golf pro shop in 1988. The golf pro suggested he take a swing at it, and as God would have it, Mike’s first shot went right down the middle of the fairway. In the past 20 years, he has shot par and made a hole-in-one, and has a golf handicap of less than 10. 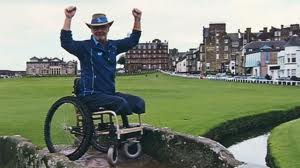 He left his true mark in golf on the Old Course at St. Andrews in Scotland, where he became the first wheelchair golfer to complete a round at the birthplace of golf. “I am surrounded by the history, not only of the game but of the players that have all walked through this fairway and over the bridge, and the ghosts are close,” he said while recalling the thoughts he had while crossing the bridge. His goal was to break 80: he shot a 79. About nine months after his round, Reeder realized another dream. After ESPN interviewed Jack Nicklaus for Reeder’s story, Scott Tolley, vice president of corporate communications for Nicklaus Corporation, arranged for Jack to meet Reeder in a charity golf tournament which was being held near Reeder’s home in the greater Nashville area. After a few moments and cordial introductions, Nicklaus grabbed Reeder’s short clubs. “Those are my short wedges I hit from my knees,” he told Nicklaus. Then Nicklaus noticed that Reeder was left-handed, and Reeder couldn’t resist a quip: “God didn’t think I had enough handicaps.” The crowd burst into laughter. Nicklaus’ admiration for Reeder is just a part of his appreciation for all veterans. Mike has recently written a book about his life experience titled “From Where I Sit”. Mike and his wife Debby currently live in Tennessee and have three children who are very supportive of their dad’s efforts, which include driving awareness for CAF through charity work. I think Mike Reeder is still living life in crescendo. Do you?